Alphabet, the last FANG stock to report earnings, has seen the weakest rebound among its peers off December lows. While Facebook, Amazon and Netflix have rallied by 23 percent or more off that bottom, the Google parent has bounced by less than 20 percent. Even that rally has pushed it too far, too fast, says Mark Newton, president and technical analyst at Newton Advisors. "Alphabet has had a very healthy rally since Christmas Eve. … It's gotten back about 50 percent of the entire decline we saw since last July. This area is important," Newton said on CNBC's "Trading Nation" on Friday. "It's likely the stock stalls out and starts to pull back a bit." The long-term chart also shows the beginnings of a head-and-shoulders formation, says Newton. That pattern forms when a high, higher high, then lower high suggest the end of a bullish trend. 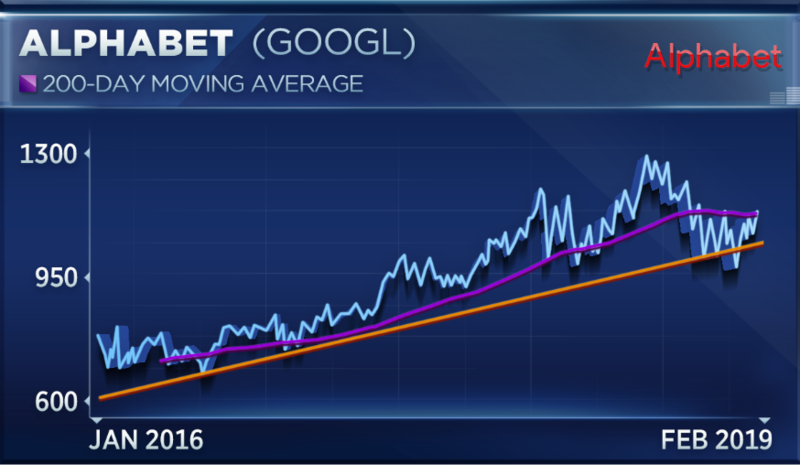 Newton says Alphabet would have to fall below $977 to confirm that pattern. "The bottom line is it had a sharp rally, whereas the broader pattern in the stock over the last year has been really flat. And so I'd rather just hold off and wait to buy under $1,050 as opposed to chasing it here," Newton said. Alphabet, which reports earnings on Monday afternoon, would need to drop 7 percent before reaching Newton's buy level. John Petrides, portfolio manager at Point View Wealth Management, is more bullish on Alphabet's outlook. He says earnings could give the stock more room to run. "The stock has had a big run post their Christmas Eve rally here, but I think there could be more to go given their growth rate. Google has had 35 consecutive quarters now where they've had 20 plus percent topline growth. That's amazing," Petrides said on "Trading Nation" on Friday. Heading into the earnings report, Petrides said the company is at the "sweet spot of e-commerce and digital advertising," so it should benefit from the same tailwinds that lifted Facebook in the last quarter. He is also watching traffic acquisition costs and how it affects margins and how Alphabet plans to spend its free cash haul. Disclosure: Point View clients and Petrides have holdings in Alphabet.